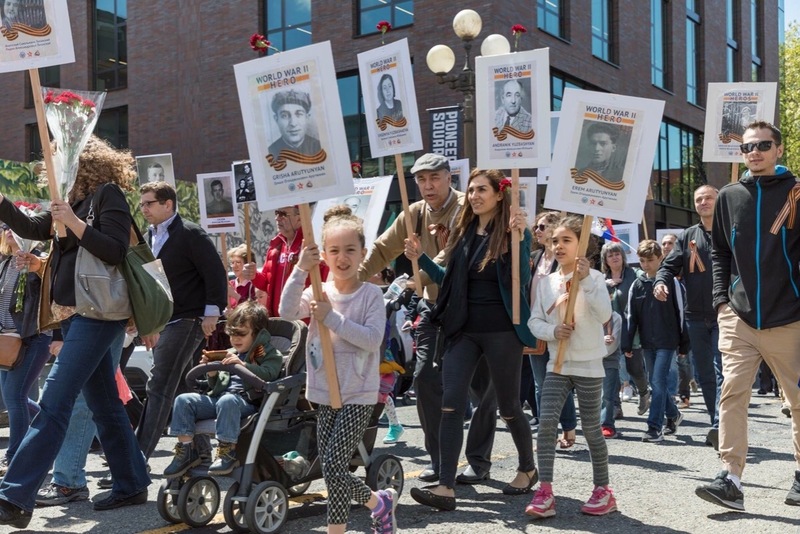 The «Immortal Regiment» - WWII commemorative initiative was born as a public movement aiming at preserving the memories of relatives participating in WWII and a ground-roots effort to publicize their stories in an attempt to stand against war through highlighting the horrors that it brings. First-ever “Immortal Regiment” rally was held in Russia in 2011 in the city of Tomsk, organized by a group of friends, local colleagues of journalism as a memorial public action supporting the May V-Day celebrations. The event caught on like fire amongst the general public due to a wide spectrum of affected families related to WWII throughout the former Soviet territory and by 2015 became an international sensation related to all WWII commemorative celebrations throughout the world. The former Soviet emigre throughout the globe, and other Alliance-related descendants of persons involved in the WWII struggle agains naziizm and fascism, including those of the German WWII resistance forces joined in the popular movement to publicly preserve and honor memories of the outgoing generation of soldiers, children of war, holocaust survivors and others related to the events of WWII. First Immortal Regiment events in the USA took place in 2015 in San Francisco, California; Miami, Florida; and New York City - organized by various enthusiasts, driven by concern of rising interest and re-emergence of neo-fascist and other extremist movements and formations throughout the world including marginal and violent organizations such as ‘Antifa’, which the initiative also neither supports or affiliates with. The initiative was quickly picked up by the Soviet emigre of the 1990’s, while supported by descendants of American WWII veterans and veterans themselves, becoming a widespread movement throughout the country every year around the V-Day anniversary dates. 2016 and 2017 saw over 3,000 participants of both emigrants and naturalized citizens honoring their veterans at memorial walks as well as ordinary American citizens. 2018 saw the biggest turnout of commemorative participants up-to-date, with over 5,000 estimated family members marching throughout twenty US cities. 2018 also became a notable year for the movement with the organizers in the US coming together to seek official, legitimate formation of the initiative into a national nonprofit organization, allowing it to become a US-based, grass roots commemorative cause aimed at preserving the memories of all Allied veterans and what they have achieved in WWII. Today, the official organization, along with its partners and affiliates, continues supporting and expanding the public initiative, aiming at preserving the memories of WWII veterans of the Alliance through encouragement of public awareness and education of the causes and costs of WWII.